Although I have never made a patchwork quilt, I love quilt blocks. Having the attention span of a goldfish, I usually avoid huge projects this because I know there’s a good chance I won’t ever finish them! 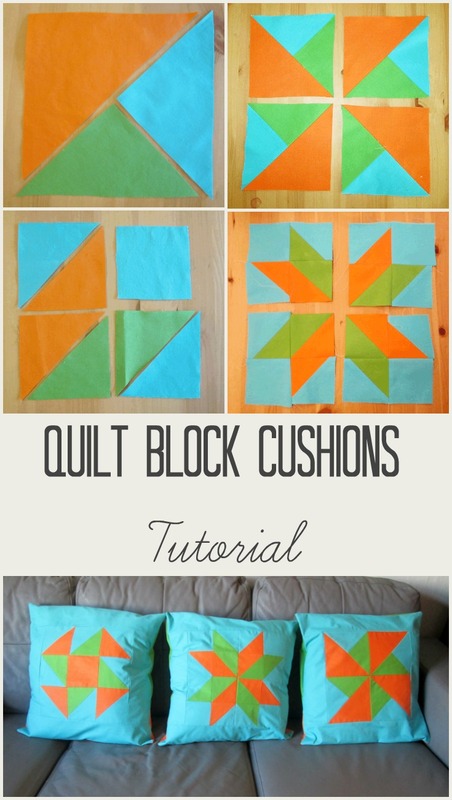 But quilt blocks don’t just have to be for quilts. They can be used on bags, purses and cushions too. The blocks can be as big or as small as you like. You can use 1 tiny block on a little purse, and several small blocks or one larger block on a cushion or a bag. 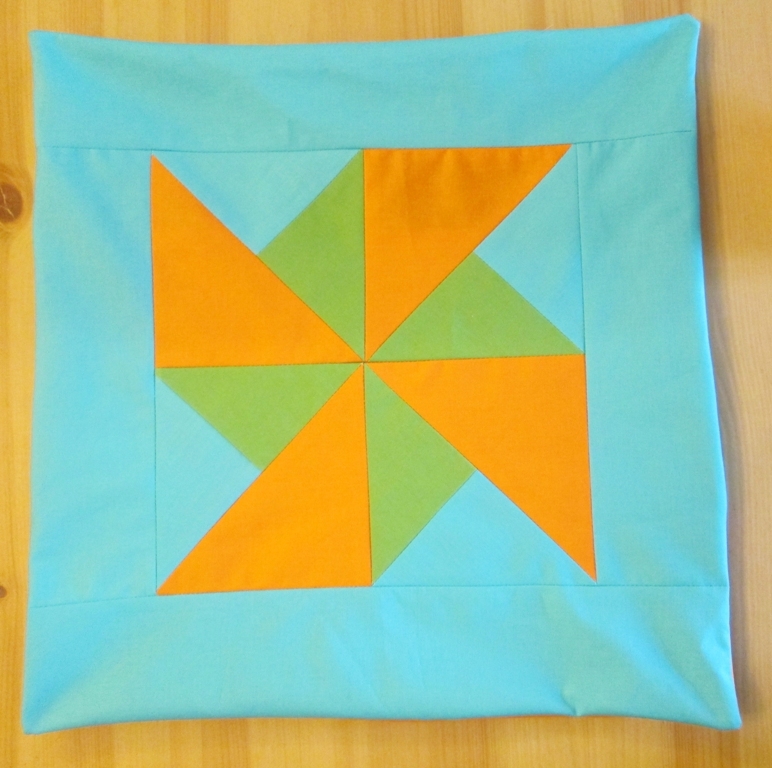 For the Minerva Crafts Bloggers’ Network I made 3 quilt block cushions using my 3 favourite quilt blocks, the pinwheel, the 8 pointed star and the comet star. You can find the full tutorial here. 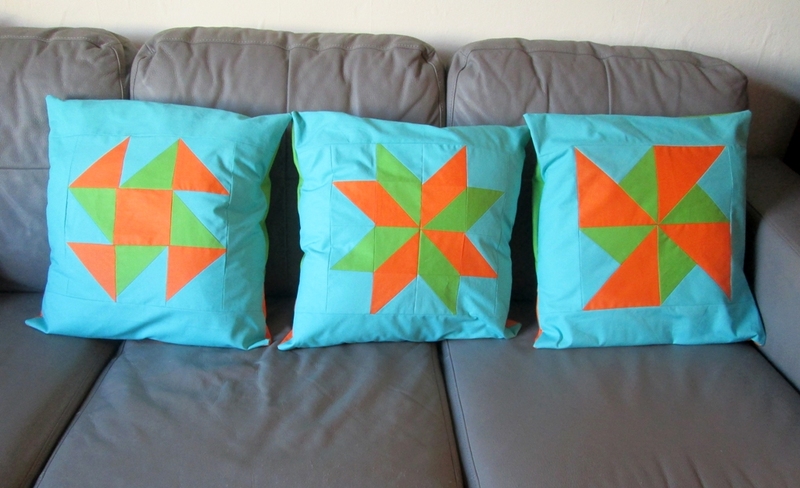 To make the cushions, I used Klona cottons in Lime, Turquoise and Orange. I already had bunting in these colours and they are very similar to some of the colours in my curtains (you can read about those here!). Although the Klona cottons can be expensive and polycotton would definitely be cheaper, I think you get what you pay for here. The Klona cottons are good quality and will wear and wash well. Polycotton wears less well and would probably go bobbly after a few washes. With 4 mucky little boys, a cat and a tendency to miss my mouth whilst eating ice cream on the sofa, I need cushions that I can chuck in the washing machine without worrying about them! For each cushion, I made 1 block and added a turquoise border. The cushions have envelope backs in orange and lime. In the tutorial, there are full instructions for making the blocks, including how to make the templates. If you don’t want to make the templates yourself, you can download some free templates here. So lovely and bright, I totally agree about getting what you pay for when buying fabric. Really wonderful, and a great way to practice making quilt squares. thanks for sharing on craft schooling Sunday! Another wonderful inspiration, thank you for sharing at The Really Crafty Link Party. Pinned!